Honeyeaters are unique to Australasia with around 170 species recorded. Most honeyeaters are nectar feeding birds with long, brush-tipped tongues which function in the same way as a paintbrush, soaking up fluids by capillary action. Most honeyeaters can protrude their tongues well beyond the tips of their beaks, enabling nectar collection from the base of long tubular flowers, honeydew extraction from deep, narrow cracks in bark and collection of manna from damaged tree trunks and branches. They lap up these fluids at rates of 10 or more licks per second and can empty a flower in less than one second. Honeyeater beaks are thin, curved and sharply pointed, reflecting to some extent the sorts of flowers they frequent. Honeyeaters are not totally dependent on nectar. 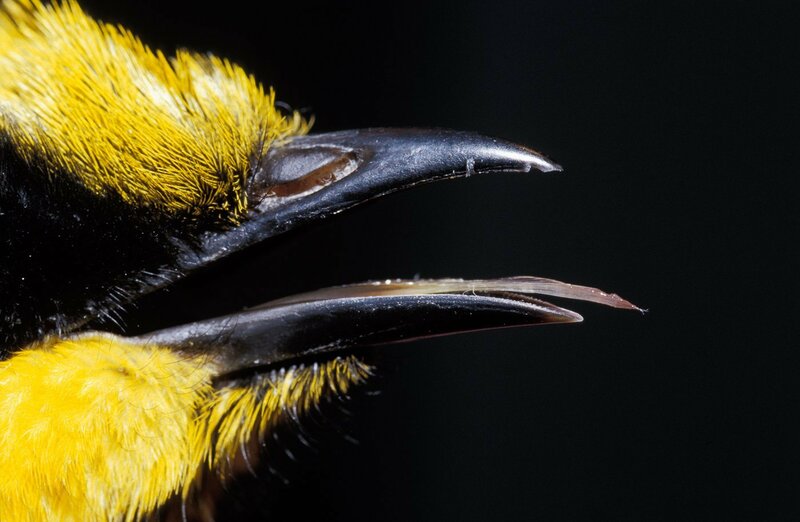 For some, such as the Helmeted Honeyeater, nectar only forms around 25% of their diet. Why is the Helmeted Honeyeater unique? In 1971, the Helmeted Honeyeater was chosen as Victoria’s bird emblem. What does the Helmeted Honeyeater look like? They are black, yellow and olive-brown in colour with a bright yellow crest or helmet which distinguishes them from all other honeyeaters. The outer tail feathers are tipped white. There is no colour difference between male and female birds. The Helmeted Honeyeater is approximately 20cm from bill to tail tip. What is the status of the Helmeted Honeyeater? Helmeted Honeyeaters are critically endangered. Numbers declined from a counted 167 birds in 1967 to a low of 50 birds in 1990. As with any species, the population rises and falls with the seasons. In March 2018 there were estimated to be about 200 birds left in the world. How long do Helmeted Honeyeater’s live in the wild? The oldest bird on record is a male hatched and banded at Cockatoo Swamp at Yellingbo in mid-November 1994 and still being seen in June 2011, making him over 16 years old. Helmeted Honeyeaters born in the wild at Yellingbo usually have a shorter life span however. Females have an average life expectancy of around 4.44 years and males approximately 5.73 years. What is the Helmeted Honeyeater’s Taxonomy? The Helmeted Honeyeater Lichenostomus melanops cassidix used to be considered a separate species. Today it is considered to be the largest and most colourful of the four subspecies of the Yellow-tufted Honeyeater Lichenostomus melanops. I saw a Helmeted Honeyeater in my garden… or was it another subspecies of the Yellow-tufted Honeyeater? Individuals of the gippslandicus subspecies can have a helmet; though, usually smaller than that of cassidix (Helmeted Honeyeaters). There is overlap in overall body size between small cassidix and large gippslandicus individuals. The meltoni and the melanops subspecies are smaller and duller in plumage. A 2013 genetic study (yet to be published) suggests that L.m.cassidix is genetically distinct from L.m.gippslandicus and L.m.gippslandicus is genetically distinct from L.melanops. Healesville Sanctuary has a captive breeding program for the Helmeted Honeyeater. There are currently three small semi-wild populations established in remnant streamside swamp forest to the east of Melbourne. 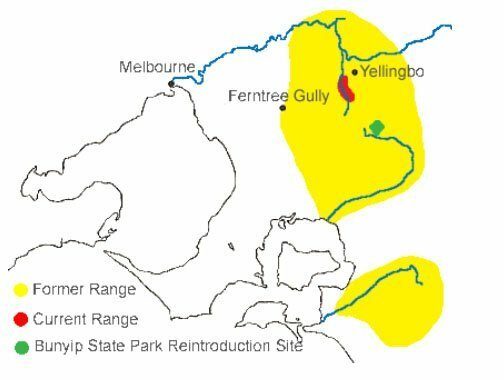 Between 2001 and 2012 reintroduction sites were established in Bunyip State Park and in 2006 a reintroduction site was established in Yellingbo Nature Conservation Reserve. Young birds produced in captivity during the previous breeding season are released into reintroduction sites each year. The map (right) shows the past known distribution of the Helmeted Honeyeater in the mid 1800’s (extensive documented surveys provide evidence of this range), the only remaining wild population (in red) and the failed reintroduction site (in green). What is the natural habitat? The Helmeted Honeyeater prefers riparian and swamp forests dominated by Manna Gum (Eucalyptus viminalis), Swamp Gum (Eucalyptus ovata) and Mountain Swamp Gum (Eucalyptus camphora). Understorey shrubs, such as Broom Tea-tree (Leptospermum scoparium), Scented Paperbark (Melaleuca squarrosa), Prickly Currant-bush (Coprosma quadrifida) and Woolly Tea-tree (Leptospermum lanigerum) provide nest sites for the Helmeted Honeyeater. Streamside forests are now rarely more than 200m in width in agricultural areas such as Yellingbo. What does the Helmeted Honeyeater eat? Approximately 25% of the Helmeted Honeyeater’s diet is nectar and 75% comes from other sources, including lerps that are often found on the leaves of Eucalypts. What is the social behaviour of the Helmeted Honeyeater? Each breeding pair has a territory of its own which it defends vigorously as an exclusive feeding area, around half a hectare in size. Breeding territories are usually clustered into overlapping neighbourhoods. If an intruder enters one of the territories within a neighbourhood, Helmeted Honeyeaters from nearby territories will come to help drive out the intruder. Commonly, the female offspring will be forced to disperse whilst male offspring are accommodated within a territory until they either find a territory of their own or disperse looking for a partner. Smales, I.J. (2004).Population ecology of the Helmeted Honeyeater Lichenostomus melanops cassidix: long-term investigations of a threatened bird. Honours thesis, Melbourne University, Melbourne, Victoria. What are the breeding habits of the Helmeted Honeyeater? The breeding season can run from early August through to early March. Birds are sexually mature at one year of age but most do not breed until they are two years or older. Helmeted Honeyeaters construct a suspended cup shaped nest, often located in prickly shrubs. Nests are made of strips of bark, grasses, dried leaves and are bound loosely with cobwebs. Spider egg sacs are used for decoration. Nests can range from as low as 1 metre from the ground to as high as 4-8 metres in dense shrubs. Occasionally, nests are over 20 meters high in eucalypts. Usually two eggs are laid, very occasionally three, with three or four clutches per season. The female sits on the eggs for 2 weeks before the young hatch. This is the only time that a positive identification of a female bird can be made through observation alone. Helmeted Honeyeaters are cooperative breeders. The young are fed in the nest for a further 2 weeks by both parents and sometimes related males. The young remain with their parents after leaving the nest for several months. At 40 days they are considered independent. Smales, I.J. (2004). 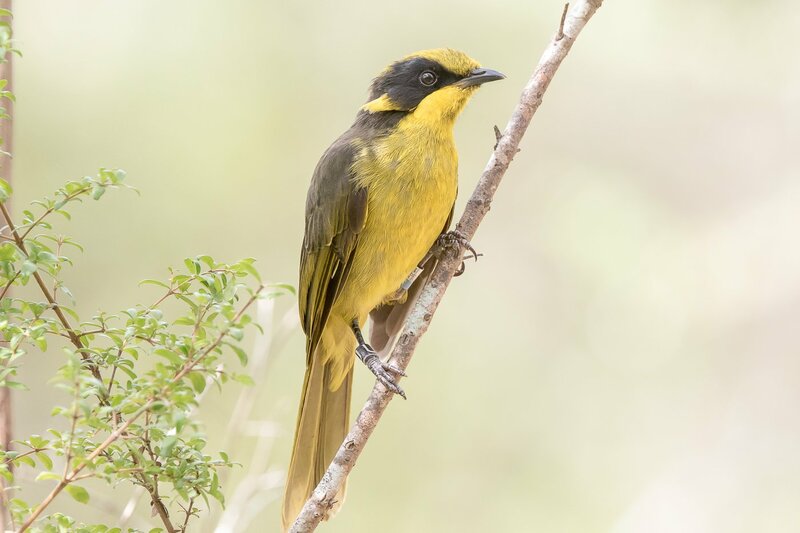 Population ecology of the Helmeted Honeyeater Lichenostomus melanops cassidix: long-term investigations of a threatened bird. Honours thesis, Melbourne University, Melbourne, Victoria. Question: What does 14 plus 2 plus 1 (sometimes 2) plus 15 plus 13-14 equal? Answer: The Helmeted Honeyeater nest building, egg laying, incubation and fledgling time frame. 14 = the minimum number of days that an experienced female Helmeted Honeyeater takes to build a nest. 2 = the number of days that go by before the first egg is laid. This egg is not incubated, meaning that the Helmeted Honeyeater does not sit on the egg. 1 (sometimes 2) = another egg is laid, usually the following day, then occasionally a 3rd egg is laid the day after. Only after the last egg is laid does the female Helmeted Honeyeater start to sit on the nest. This process delays development of the first egg so that chicks hatch around the same time. 15 = the number of days that the eggs are incubated. Only the female Helmeted Honeyeater does this. On day 14 the young birds start to hatch from the eggs. They are called nestlings at this stage of their development. 13-14 = the number of days that the nestlings remain in the nest and are reared by both of their parents. Sometimes another related Helmeted Honeyeater will help feed or protect the nestlings. This is called cooperative breeding. Around day 14, the nestlings leave the nest. They are now called fledglings. Their parents will continue to feed them for a while whilst they learn to fend for themselves. At 40 days they are considered to be well on their way to feeding independence. Each pair of Helmeted Honeyeaters may do this 4 times over the course of a breeding season – August to March. Wow. We think young people today grow up fast and that parenting is in the fast lane! What an incredible journey from birth to adulthood for our native species. If the age of a captive and wild nest are within a few days age of each other, eggs/nestlings can be fostered from captive to wild nests. This is a preferable form of ‘release to the wild’ of captive birds as they are then raised and socialised in a wild situation. The first Helmeted Honeyeater and Leadbeater’s Possum specimens were taken from the Bass River area near Westernport Bay. Clearing of Koo-Wee-Rup Swamp begins and continues for another 80 years. Ptilotis cassidix is reclassified as Lophoptilotus cassidix. L. cassidix reclassified as Meliphaga cassidix. Helmeted Honeyeater first found at Woori Yallock Creek ‘about two miles south of Yellingbo’, by the son of ornithologist A. G. Campbell. November edition of Victorian Naturalist is devoted to the Helmeted Honeyeater. Royal Australasian Ornithologists Union (RAOU) survey at Cardinia Creek area suggests around 100 birds exist there. Survey Cassidix commenced by Bird Observation and Conservation Australia (known then as the Bird Observers’ Club) at Yellingbo and investigates the bird for 10 years. First portion of Yellingbo State Fauna Reserve is established specifically for a Helmeted Honeyeater sanctuary. Yellingbo State Faunal Reserve officially proclaimed. Around 200 Helmeted Honeyeaters counted in the wild. The Helmeted Honeyeater is proclaimed as one of Victoria’s State Faunal Emblems on 10th March. The Helmeted Honeyeater is reclassified as a sub-species of the Yellow-tufted Honeyeater Meliphaga melanops cassidix. The Yellow-tufted Honeyeater is included into a redefined Honeyeater genus, Lichenostomus. The Helmeted Honeyeater is thus Lichenostomus melanops cassidix. The Fisheries and Wildlife Division commences staffing and active management of the Yellingbo State Faunal Reserve. The State and Commonwealth Governments contribute funding to a land purchase program of adding substantial further land to the reserve. Ash Wednesday fires destroy the habitat of colonies of Helmeted Honeyeaters at Cockatoo and Upper Beaconsfield. Subsequently the birds become locally extinct leaving the Yellingbo population as the sole remaining group. Long-term monitoring of the Yellingbo Helmeted Honeyeater population commences. Leadbeater’s Possum is discovered at Yellingbo. A public meeting is called and The Friends of the Helmeted Honeyeater is formed on 23rd May. The Helmeted Honeyeater Recovery Team is officially formed. A captive breeding program is commenced at Healesville Sanctuary. The Friends establish an indigenous plant nursery at Healesville Sanctuary. The Friends indigenous plant nursery commences operation at Yellingbo. First reintroduction of captive bred birds back into the wild occurs at Yellingbo. It was unsuccessful but much was learnt. After a fight to save it from demolition, the former Ranger’s House at Yellingbo becomes the Friends headquarters. Helmeted Honeyeaters go on display at the Healesville Sanctuary. The wild population increases to 90-100 birds with 15 potential breeding pairs in the captive group at Healesville Sanctuary. The first reintroduction of captive bred birds into former habitat occurs at Tonimbuk within Bunyip State Park. A plan is proposed to link the renamed Yellingbo Nature Conservation Reserve (YNCR) with Bunyip State Park along a revegetated Shepherd Creek. Bushfires come within 300 metres of the release sites at Tonimbuk. Fortunately no birds are lost. The wild population decreases to around 70-80 birds at Yellingbo. The Friends investigate the possible purchase of land adjoining the Reserve. A forum is called to bring together all relevant parties to draw up a future habitat plan for the Yellingbo area. A 20ha property on the Woori Yallock Creek containing significant streamside habitat is purchased by the Judith Eardley Save Wildlife Association for a future extension to YNCR. A further reintroduction program begins at Yellingbo with the release of seven Helmeted Honeyeaters. More releases follow at Yellingbo and Tonimbuk. Former Premier Joan Kirner launches the Woori Yallock Creek Local Area Plan which is designed to seek local landholders cooperation to protect and improve the natural habitat. A record number of 28 birds are released into the wild for one season. A third reintroduction site is established at Gembrook. A new release strategy is employed, using portable aviaries. The Friends campaign hard, together with like-minded local environmental groups, to bring public land in the Woori Yallock Creek sub-catchment under the one banner of Yellingbo State Emblems Park. This Park would further protect and provide greater coordinated management of public land. Bi-partisan political support is gained and the proposal is referred to Victorian Environmental Assessment Council (VEAC) for consideration. The proposal is accepted and the Yellingbo Investigation begins with the first round of community consultation! Radio tracking of release birds is re-established. The Gembrook release site was unsuccessful. Helmeted Honeyeaters were found to be moving between Tonimbuk and a 2009 fire affected area at Labertouche North. A new release site is established in Labertouche North. Three monitoring systems are employed: visual monitoring, radio tracking and, new in 2012, microchip sensors at supplementary feeding stations. A new reintroduction site is established at Yellingbo, with twelve birds released in October. Microchip sensors augment the daily monitoring undertaken by volunteers. 65 regular volunteers are now part of the supplementary feeding program which operates 365 days p/year. On average, these volunteers contribute 575 hours every month to this program. The Final Report of the VEAC Yellingbo Investigation is released. The State Government is expected to report on the recommendations in early 2014. Across Yellingbo NCR, 36 fledglings were produced in the 2013/14 breeding season. In March, the State Government hands down its response to VEAC’s Yellingbo Investigation. There is overwhelming support for the recommendations. A Yellingbo Conservation Area Coordinating Committee is to be formed this year to oversee and coordinate land management for nature conservation and biodiversity programs. At 1/12/14, there are more Helmeted Honeyeaters at Yellingbo (at least 130) than at any time in the Helmeted Honeyeater Recovery Programs history (25 years).